“Quanto è costato?” I asked the chef, impressed by its gleam, its glowing controls and how cool it feels to the touch; Maurizio’s pizzas bake to crispy/chewy perfection at 380 degrees C (700-plus F) in just two to 2.5 minutes. “Tres cher!” was all he’d say, with a big smile. Noising quarrel versus neighbours in Provence? Never! The menu at Da Peppe is a la carte only, with a lunch-time plat du jour priced at 13€. John tells me his best-selling main courses right now are the Risotto St. Jacques “a l’encre de seiche” (­­­Squid Ink Risotto with Scallops) and the Saltimbocca alla Romana (veal with ham and sage, rolled up and cooked with white wine and butter). But pizzas are far and away the most-popular choice, with the Pizza Nona–scallops, arugula, truffle oil, olives, crème fraiche, mozzarella—currently in the lead. My friend Lorraine and I shared a Pizza Decima (tomato, fresh buffalo mozzarella, gorgonzola, cherry tomatoes, basil, olives), a Pizza Settima (tomato, gorgonzola, pecorino, fresh ricotta, olives) and the Salad Burrattina (tomatoes, Burrata cheese, arugula, pine nuts, balsamic syrup). I thought all three were terrific. And Lorraine, who happens to be a bit pizza-obsessive and has always been staunchly loyal to Pizzeria Brun in nearby Maussane, proclaimed everythingbellissima e molto bene! Or something very funny-sounding that meant that. The atmosphere in Da Peppe’s dining room is warm and welcoming; the staff young, handsome and professional . (Don’t be surprised to see Jean-Pierre Ricci, the owner of nearby L’Áile ou la Cuisse, helping out; he’s Laetitia’s father.) The vibe is casual—jeans are fine—but in the evening the crowd makes an effort to kick it up a notch, clothes wise. Dining all around us I saw dating couples, young families, foreign tourists, familiar local faces and a large gaggle of girlfriends sharing pizzas, carafes of wine and laughter. Da Peppe has a handful of sidewalk tables and a terrific rooftop terrace too, with views of the Place Republique (that sounds so much better than saying ‘the big parking lot,’ no?) and our enormous church, with bits dating to the 14th century. 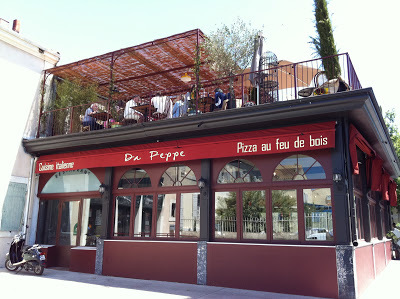 Da Peppe is a much-need addition to the dining scene in St. Remy and I’m so happy to have them in my quartier. 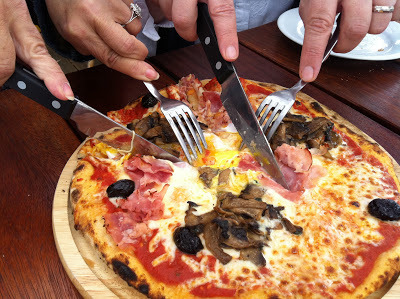 All hail chef Maurizio, the new Prince of Pizza in Provence! 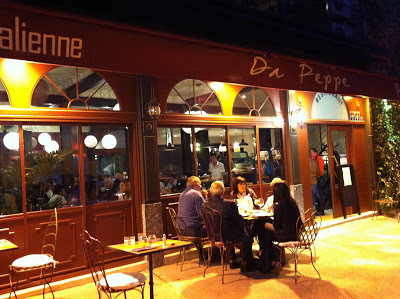 Da Peppe, #2 ave Fauconnet (next door to the cinema), St. Remy, 04-90-92-11-56.